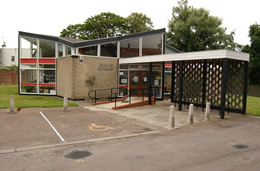 As reported on Wordblog the Aldeburgh Library Manager has resigned due to disagreements with the strategy of Suffolk County Council and the local library steering group. The Aldeburgh steering group is chaired by Clive Fox who was recently appointed the first Chairman of Suffolk's Libraries IPS. 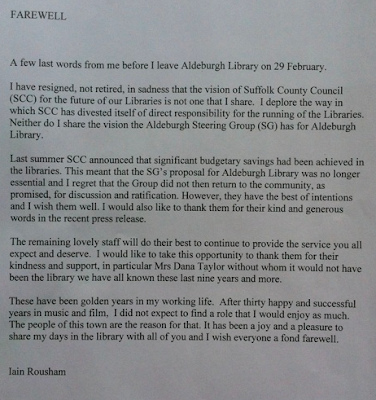 In a notice left in the library Iain Rousham says "I deplore the way in which SCC has divested itself of drect responsibility for the running of the libraries:"
The letter gives a rare glimpse of the personal damage caused during the library restructuring and the loss of valuable and respected staff. "Judy Terry, like a drowning woman, clutched at Clive Fox as a man who could deliver her plan"
This is embarrassing to both Suffolk County Council and the IPS and it appears Fox attempted to present Rousham's departure as a "retirement" when it clearly was not. Wordblog published a post entitled "The Strange choice of Chairman for Suffolk Libraries co-operative"
I am a little surprised that he appears to have failed to get that credibility even in his home town and with his own Library Manager. The IPS faces an uphill struggle to convince weary staff that it will act in their interests. The fact that the Chairman has not been able to do this in his home town is a cause for concern. So far the IPS has failed to put sufficient distance between itself and the County Council. Only in the last few weeks the IPS Chair's submission to the Culture, Media and Sport Select Committee inquiry on libraries is very much in the image of Suffolk County Council's view. I understand that the County Council are having difficulties getting anyone to agree to work at Aldeburgh and as Wordblog reported neither Fox nor anyone from Aldeburgh was present at a meeting of pilot libraries in Bury St Edmunds earlier this week. To my mind the appointment of Fox as Chairman is looking more and more like a mistake and it will be interesting to see if he survives this early embarrassing incident.